There is something to be said for ending a day at Walt Disney World with a fireworks display that lights up the sky. Sprinkle in a story that tugs at guests’ heart strings and sense of who they are in the grand scheme of humanity, and you have a spectacular that will forever be burned into the imaginations and memories of those who witness it. 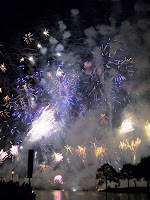 I am, of course, speaking of IllumiNations: Reflections of Earth. As fabulous as the experience of IllumiNations is, there is a way to make the moment even more unique, by touring the Epcot resort area via an IllumiNations cruise. The cruises start from Yacht and Beach Club’s Bayside Marina approximately an hour before IllumiNations is scheduled to start. Turning away from Epcot, the boats journey through Crescent Lake towards Disney’s Hollywood Studios, offering a distinctive view of Hollywood Boulevard, the Sorcerer’s Hat, and the Hollywood Tower Hotel as their lights illuminate the skyline. Venturing back the way they came, the flotilla of cruise ships move back through the waterways, passing by the Swan, Dolphin, BoardWalk, and Yacht & Beach Club, before arriving under the bridge that crosses from the France and United Kingdom pavilions in World Showcase just as IllumiNations is beginning. While there are closer vantage points for IllumiNations around the World Showcase, being on the water in World Showcase Lagoon makes the action seem all that much closer, and each concussive detonation feels as if it packs more punch. As Disney enthusiasts, most of us know the story of IllumiNations that spans the creation of the cosmos, cooling of the earth, animal life on the planet, and the course of human history as a prologue to what lies before us as a species. We all know the story, but the right captain for the cruise can make all the difference in the experience of the tale. After securing the boat, Captain Mike Scibetta move from behind the wheel and up towards the front of the pontoon boat where he becomes a master storyteller, walking the guests through each thread woven into the narrative of IllumiNations with the wonder and excitement of a child. Details that even the most thorough among us could, and likely have, missed are addressed, prominent figures in history are brought to life, and Scibetta fulfills the ambition IllumiNations has always sought to bring to its viewers, he successfully binds his party closer to the human experience. An IllumiNations cruise is a wonderful way to spend an evening. They can be tailored to a birthday or anniversary, or any event in between, and allow the guests to relax take in some marvelous sights from a vantage point they may never have noticed before. With a captain like Mike Scibetta, cruise crews are not only shepherded through the canals with ease, they are also given a story they will carry with them always. IllumiNations cruises can be booked by calling (407) WDW-PLAY.